…but it’s a good tired. Two months ago I took over the One Monk Miniatures empire from Sanity Studios. They’d really lost interest and drive in the operation and I’d been a long time supporter of the enterprise and hated seeing it floundering and didn’t want to see it perish. So I bought the assets; website, forum, company blog, downloadable products and many gigs of support material. Naively I thought the operation would be much easier than it turned out to be. Some of that was my own fault for not realizing what I was getting; I thought I was getting a nice house full of cool toys, instead I got an empty lot with boxes of building materials…and the previous owner still had some of the house keys to the non-existent house up until just last week so that I couldn’t entirely move in. All better now. I re-built the website at onemonk.com (go check it and see what’s broken), put the forum back on it’s feet, and sales are rolling along at a steady trickle though the online vendor outlets. I’ve also got a slew of new models and miniature kits in the work that will start popping up in the next few months, lot’s to do, but at least its fun to do. Except for the interface at GoDaddy; like swimming through gravel some times. Their tech support is great though. I haven’t painted anything in a couple of months, there’s a big red demon sitting in my paint area looking mournfully unfinished. Did get in a test game of Harder Than Steel, the beta rules for a possible Ganesha Games sci-fi miniatures wargame, I’ll try to post about that soon. Also went to an Anime Convention and set up a sales booth, didn’t make any money but had a great time. Yes, that’s the Eagle V Winnebago from the Spaceballs movie on top, very much the crowd favorite and caused many people to stop and look over the rest of my toys. I still don’t get to paint tonight as birthday season is still ongoing and I need to make a Minecraft style birthday cake for my daughter’s birthday this weekend. Pics of that in a few days. Oh, and Reaper Miniatures has just launched another huge Bones Kickstarter, looks even more amazing than the last one. 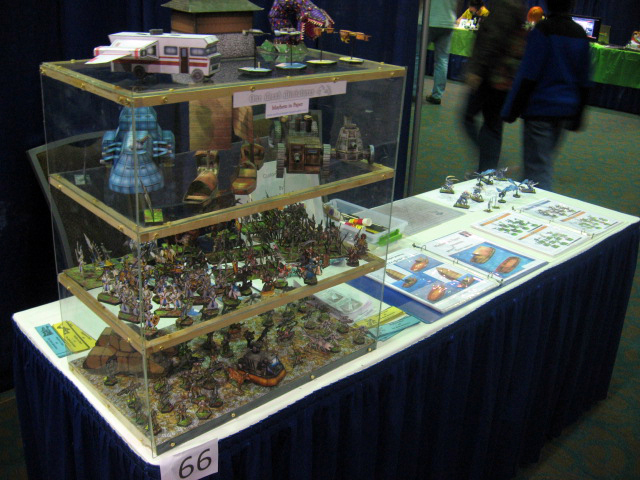 This entry was posted in Me, Uncategorized and tagged Miniature wargaming, Reaper Miniatures, Spaceballs on October 3, 2013 by squirmydad.